Hitec HS-7945TH Multipurpose Ultra Premium High Voltage Digital Servo Discounts Apply ! HRC37945S - Hitec HS-7945TH Multipurpose Ultra Premium High Voltage Digital Servo. 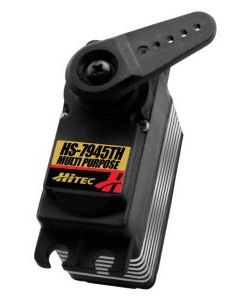 Combining high torque with high speed the HS-7945TH is Hitec's most versatile high voltage digital servo. Designed to operate on a two cell LiPo Pack, the HS-7945TH features our high resolution "G2" second generation programmable digital circuit and our indestructible Titanium gears giving you the performance and durability you've come to expect from a Hitec servo. Other features in the HS-7040TH include a 7.4V optimized coreless motor, integrated heat sink case, and a top case with two hardened steel gear pins supported by axial brass bushings. The HS-7945TH has been designed for applications where both high speed and high torque are needed. The HS-7945TH is perfect for High Performance Aircraft, Cars, and Trucks as well as larger Nitro and Electric Helicopters.